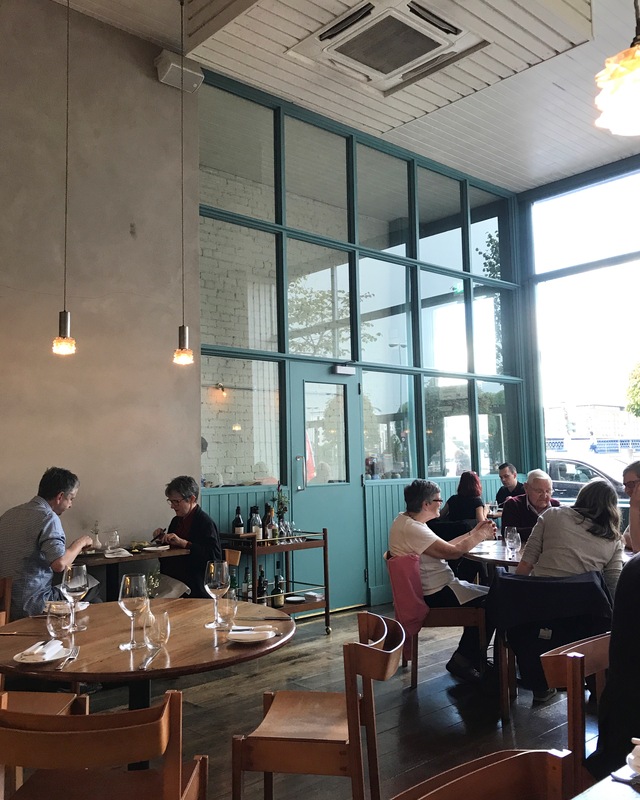 I travelled to Belfast twice over a four-week period and was wowed by the foodie scene. 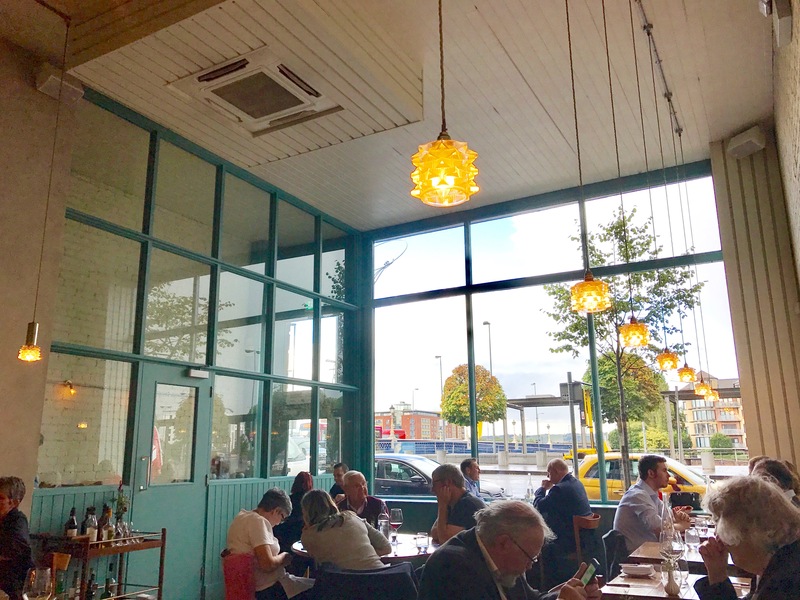 I shared my Belfast exploits through my #one2Belfast hashtag on Instagram and clearly there was no shortage of fabulous restaurants, cafes and bars for me to explore. 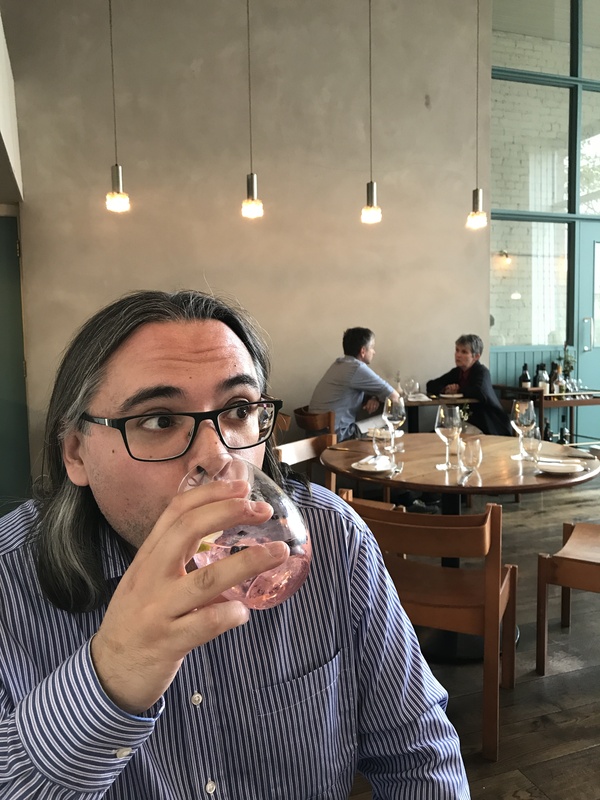 Not to diminish the other wonderful places I visited but I just have to share my experience at Ox, an amazing Michelin starred restaurant near the Belfast Waterfront. Paulo and I managed to squeeze in lunch at Ox before catching our flight back to Stansted. We booked a table ahead of time and were delighted that the timing fit in with our work and travel schedules. 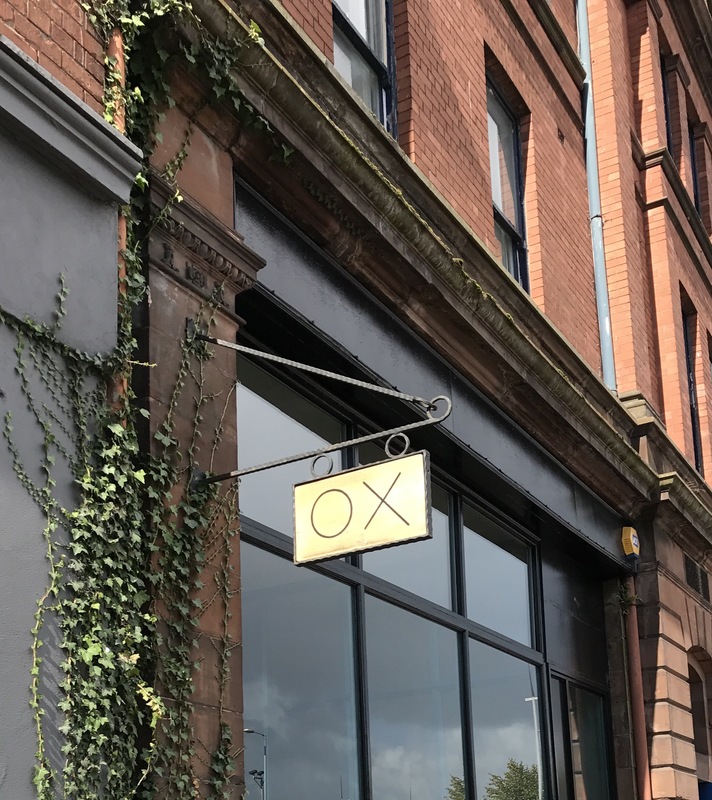 Ox looked a bit dark and unassuming from the outside but once we entered, the small restaurant was flooded with natural light from the double-height picture windows. We took in the beautiful decor with its high ceiling, serene shade of blue, modern light fixtures and wooden church chairs (with prayer book holders on the back). 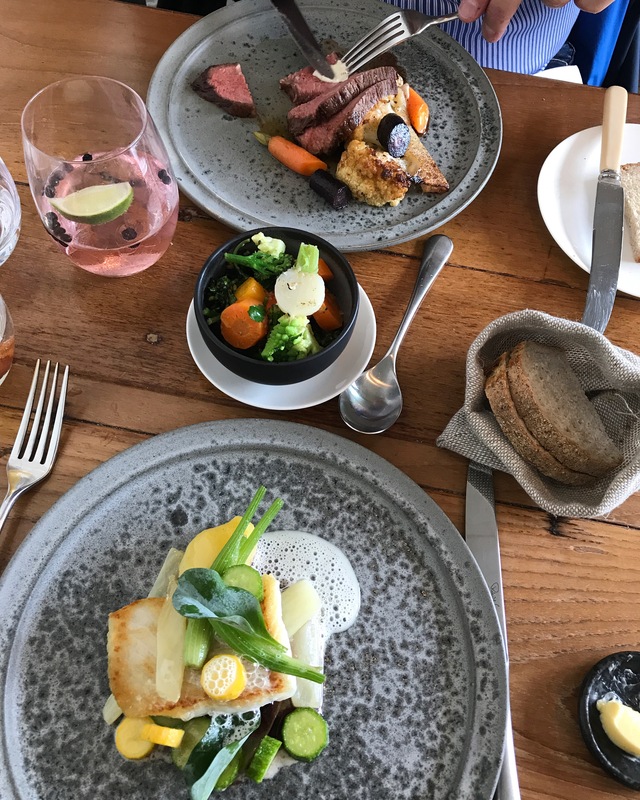 We were a little disappointed that our table was tucked away in a corner at the back of the restaurant where we couldn’t see the impressive open kitchen. I had a view of the loo door and Paulo faced the wall so despite making a reservation, I don’t think we got one of the better tables. However, it was a nice cosy spot and the light from the windows made it a bright, cheerful ambience. I don’t think I would have taken out my iPhone for photos if we were more centrally seated so it all worked out in the end. And besides, we forgot all about our seating location once the gorgeous food came out. One of our pleasant discoveries in Belfast is the range of fantastic gins from Northern Ireland. 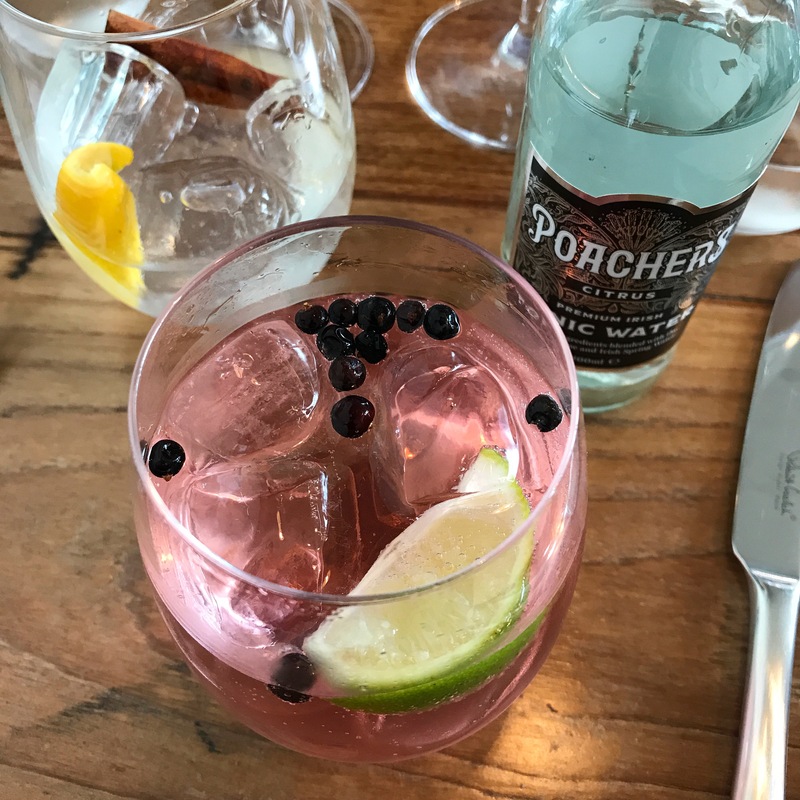 Ox offer a great selection and we chose Shortcross and Copeland gins, served with Poacher’s Premium Irish Tonic Water and fresh, aromatic garnishes. 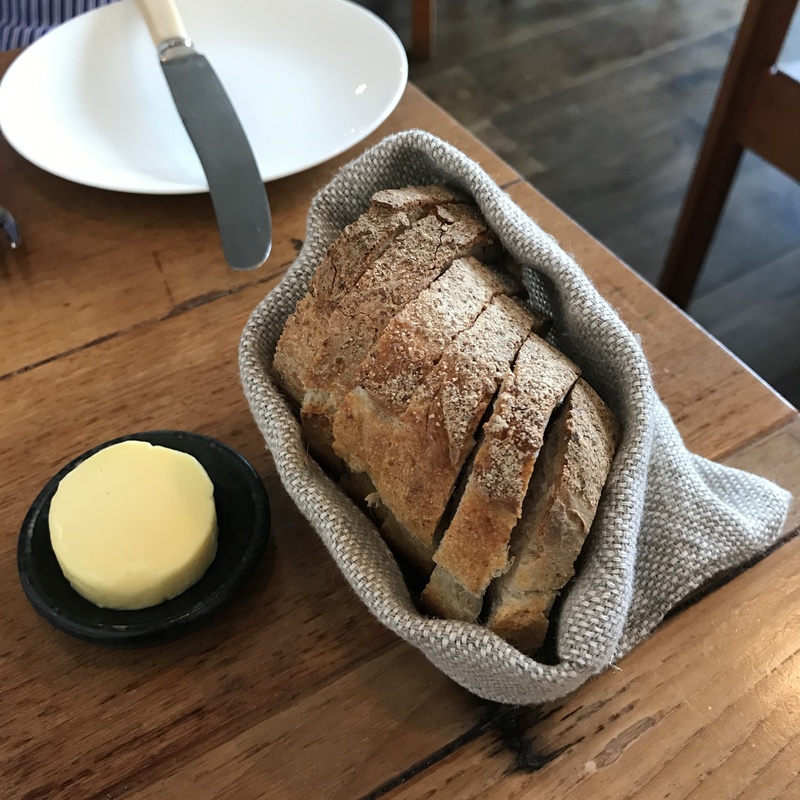 Lunch began with sourdough and Cuinneog butter. The bread was so fresh, we happily accepted second helpings. 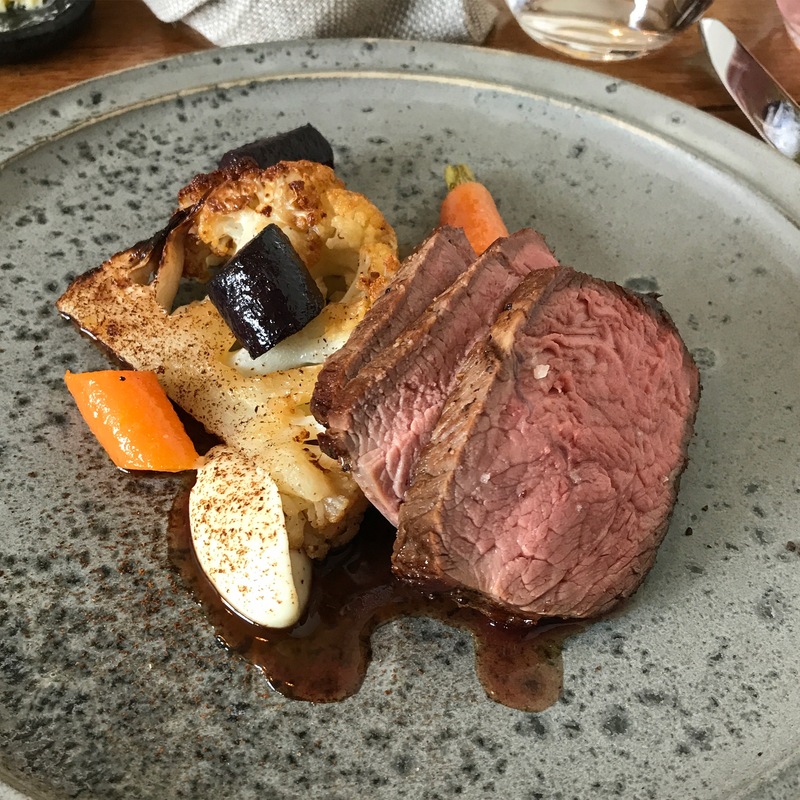 The choice of starters and mains on Ox’s lunch menu consisted of meat, fish or vegetable. My starter featured tomato, pea, Toons Bridge mozzarella and avocado. 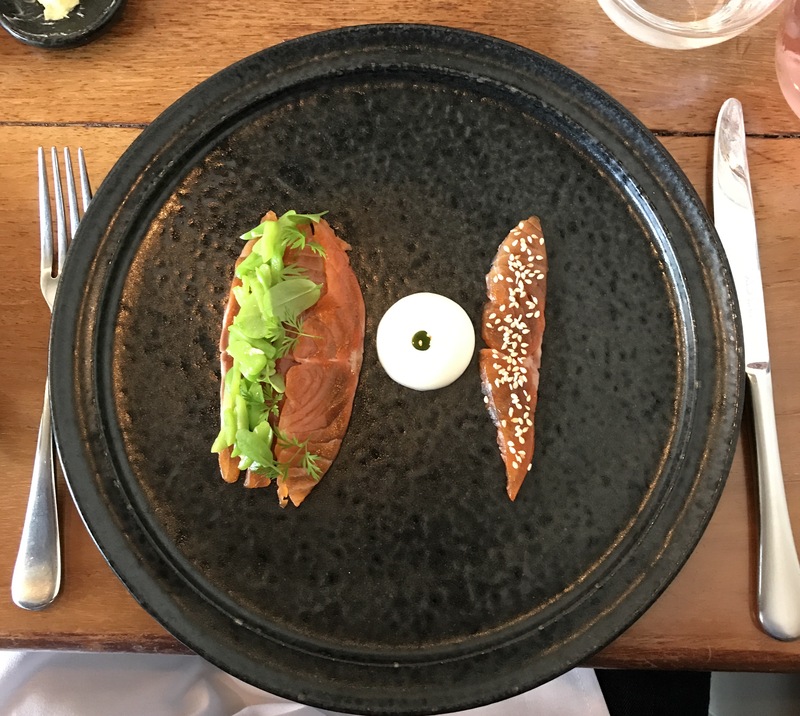 This starter was freshness on a plate, graced with the most vibrant greens and reds and dotted with orange edible petals. 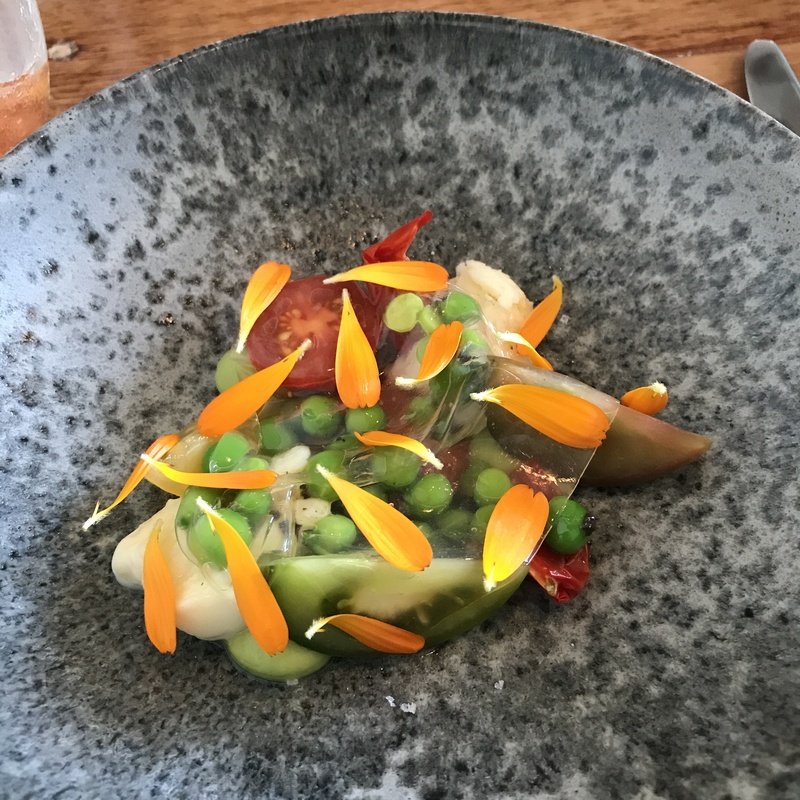 The incredibly fresh tomatoes, peas and avocado were covered with a transparent jelly-like sheet that gave each mouthful a cool wet sensation, similar to eating freshly picked, just-rinsed fruits and vegetables. 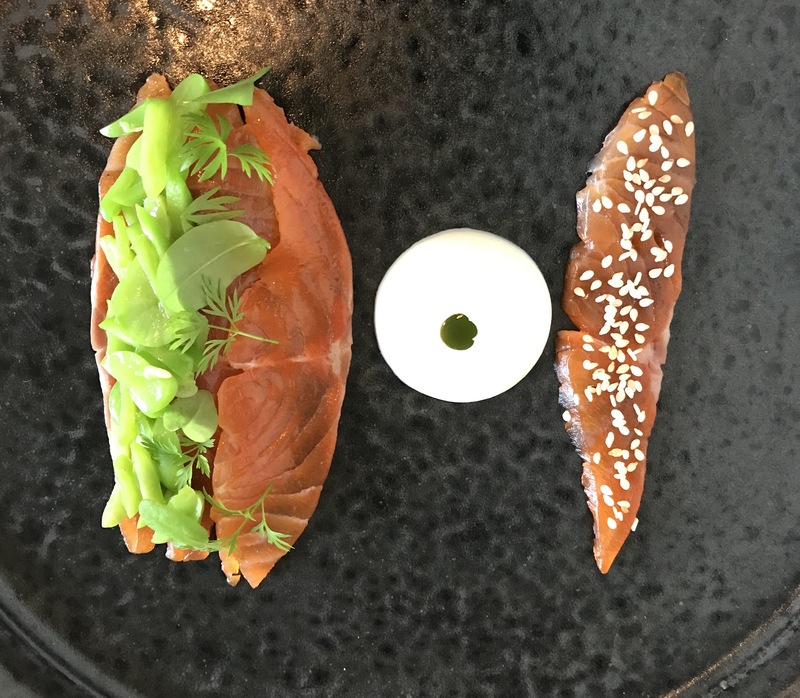 Paulo’s starter of sea trout cured in gomasio (a Japanese sesame salt) was served two ways. 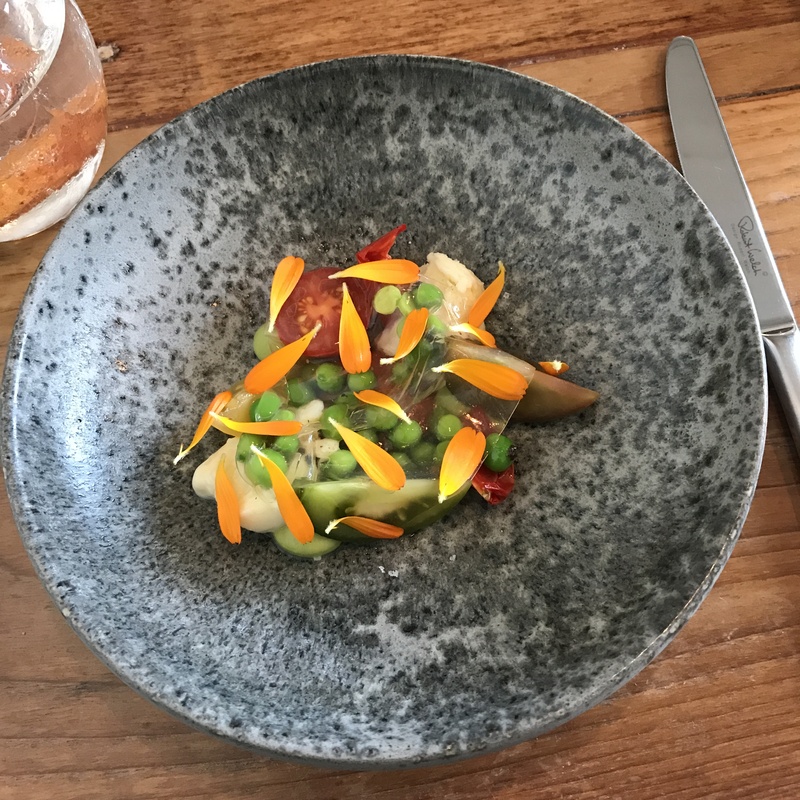 One piece featured leaves and broad beans whilst the other was topped with sesame seeds, bringing out the gomasio’s sesame flavour. 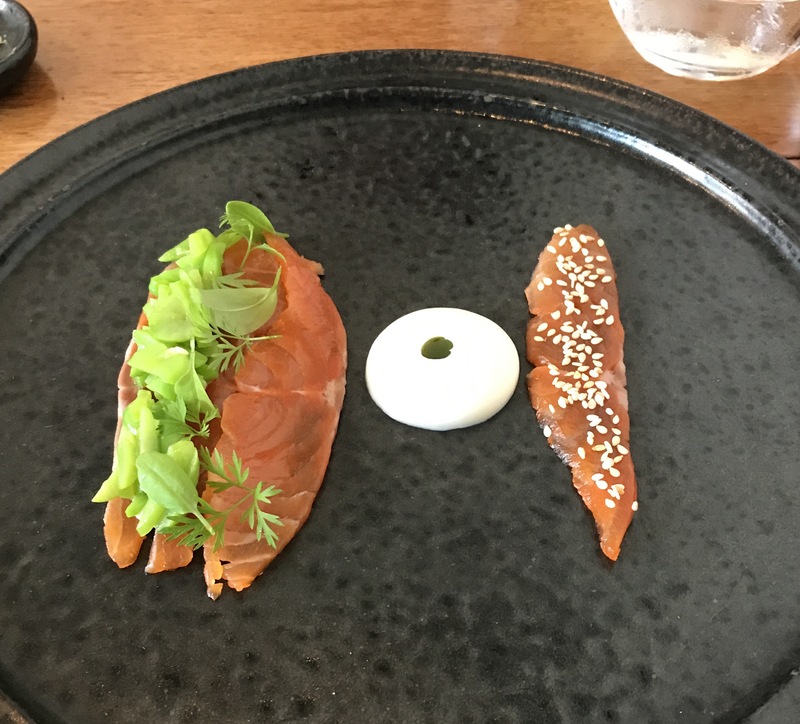 A perfectly round globe of buttermilk sat between the two pieces of trout. 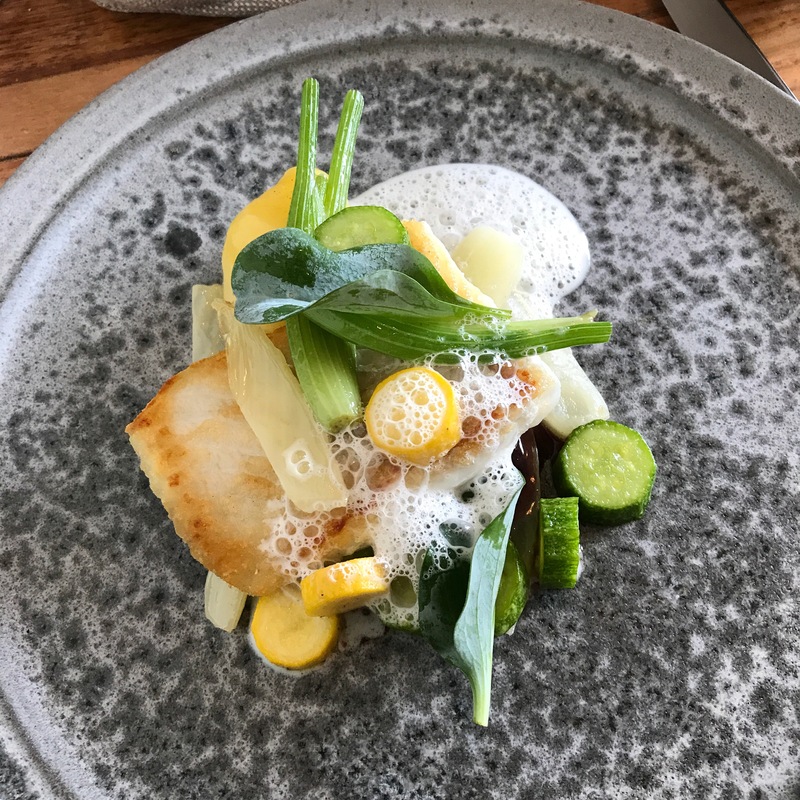 My main course of brill, courgette, dulse, red wine butter and fennel was fresh and delicious and the light, delicate foam tied in all the flavours. The high welfare rose veal in Paulo’s main course was perfectly cooked. 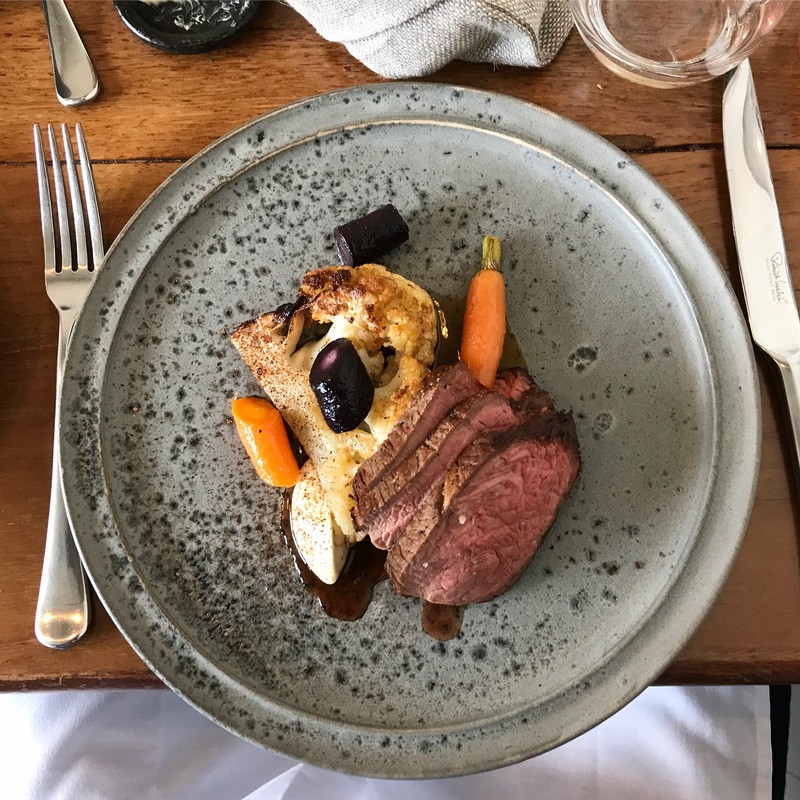 It was served with cauliflower and smoked carrots and the subtle coffee flavour enhanced the dish. 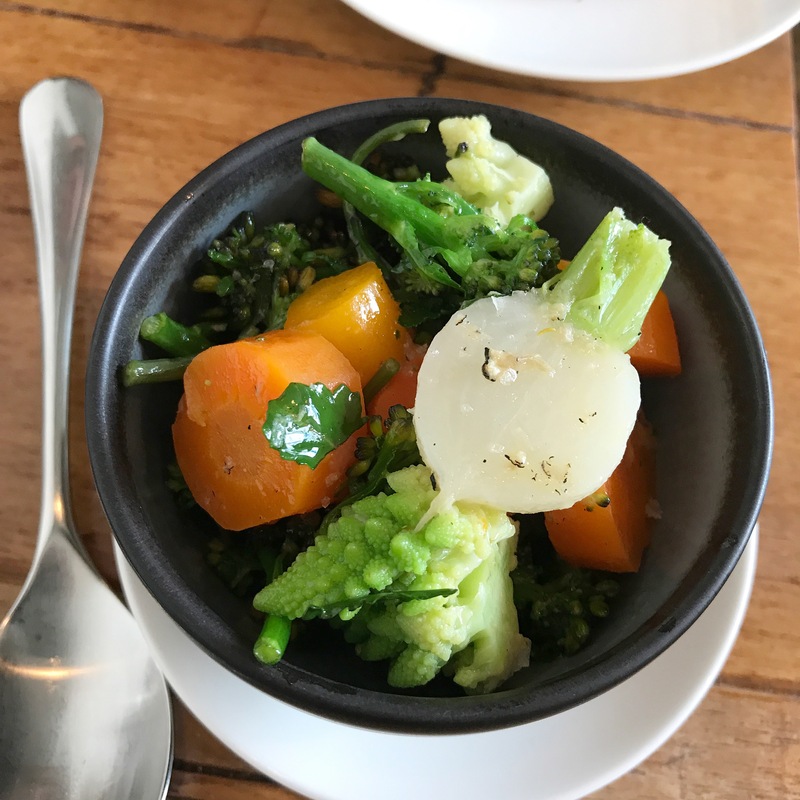 We shared a side order of garden-fresh vegetables (carrots, romanesco, broccoli, cauliflower and turnips) with truffle butter. 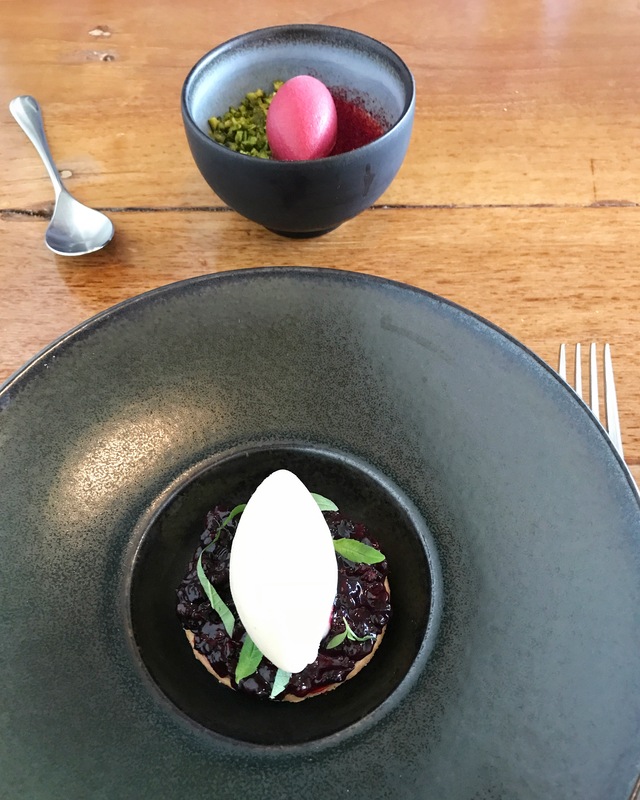 A Michelin star experience wouldn’t be complete without dessert and Ox delivered stunning little works of art. 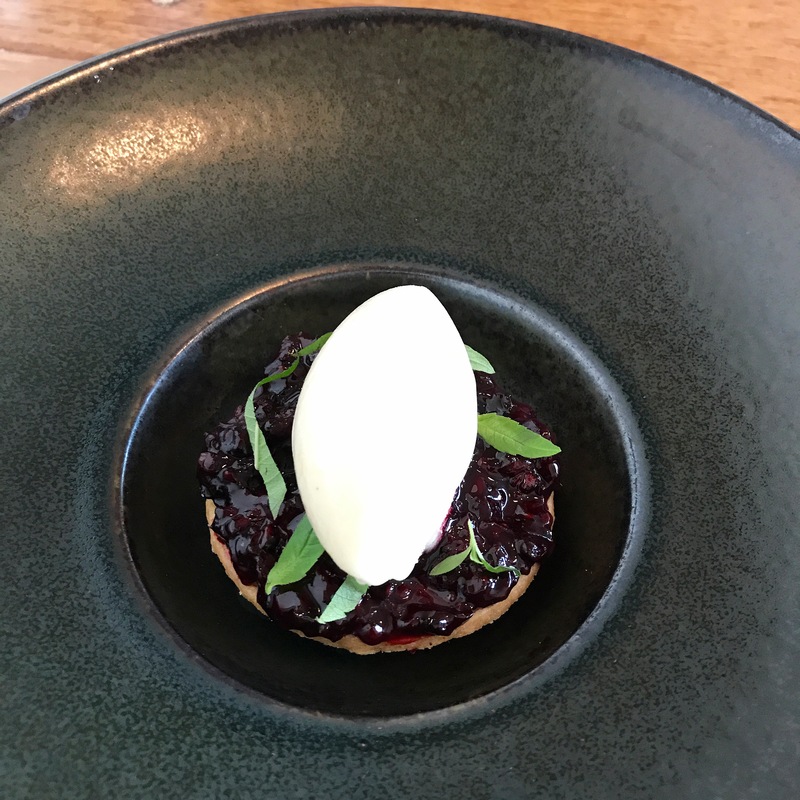 My dessert featured blackberry compote on a sablé biscuit topped with verbena and apple sorbet. 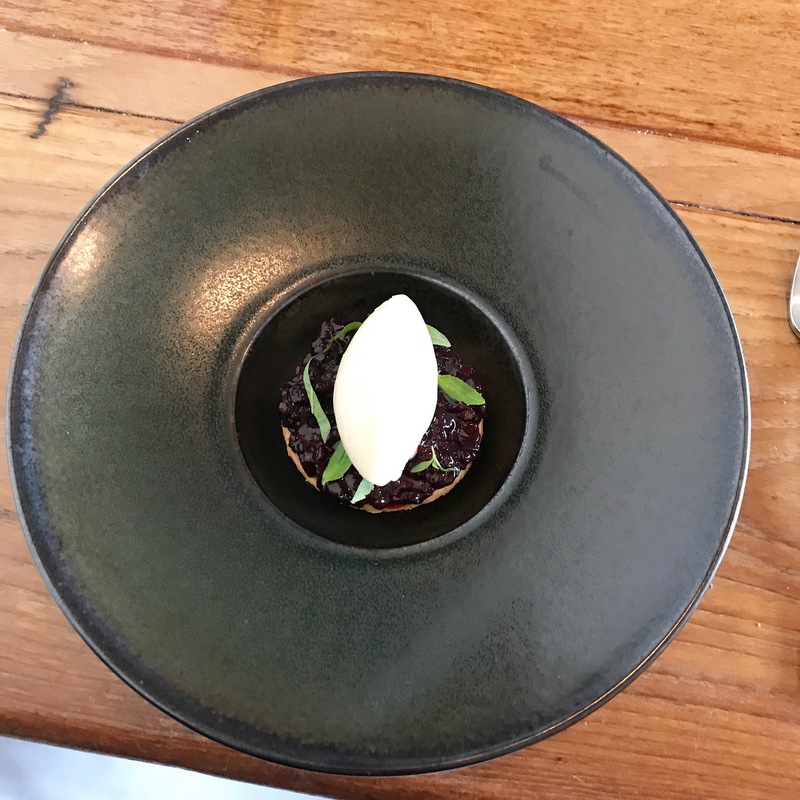 The flavours were nicely balanced with the sweetness of the biscuit contrasting the tartness of the blackberry, apple and verbena. 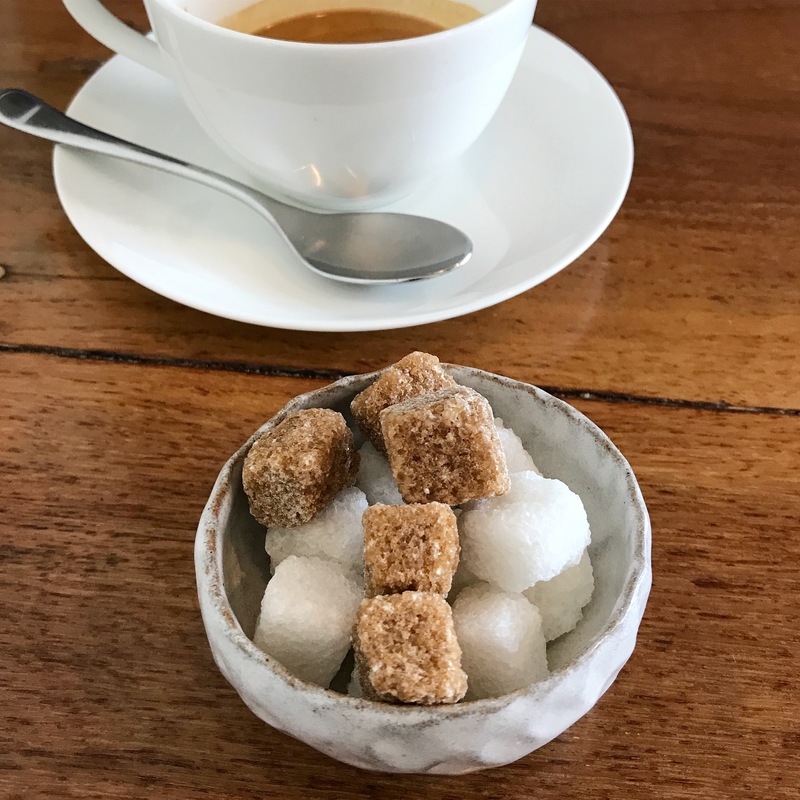 The best part of Ox’s menu is the element of surprise as the dishes are merely described by their ingredients. 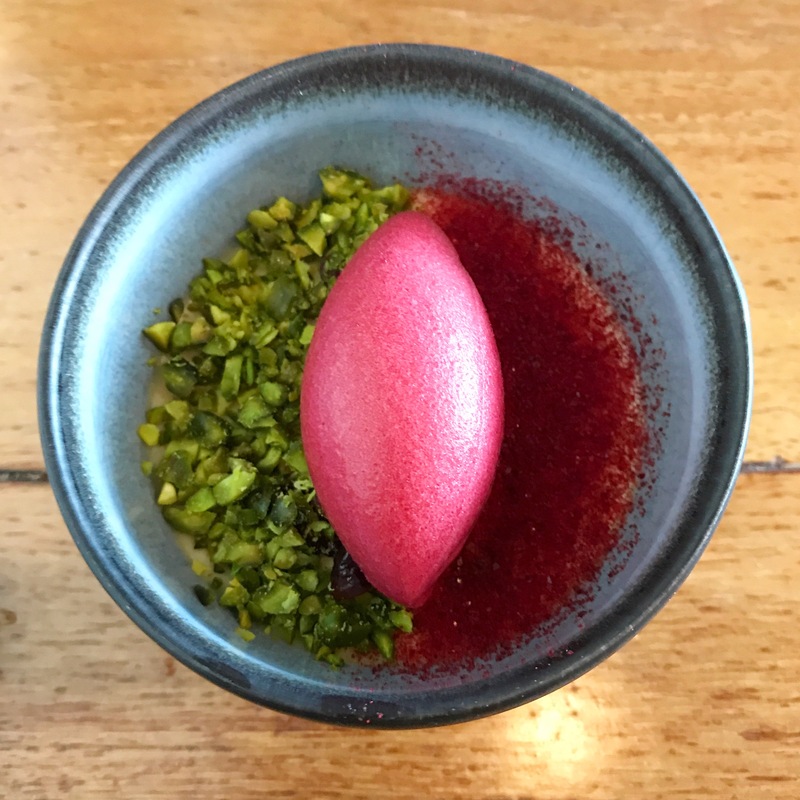 Paulo ordered the green tea, pistachio and cherry sorbet dessert and was presented with a rainbow bowl of meticulously arranged sections, topped with a perfect scoop of intensely flavourful cherry sorbet. The surprise didn’t end there. 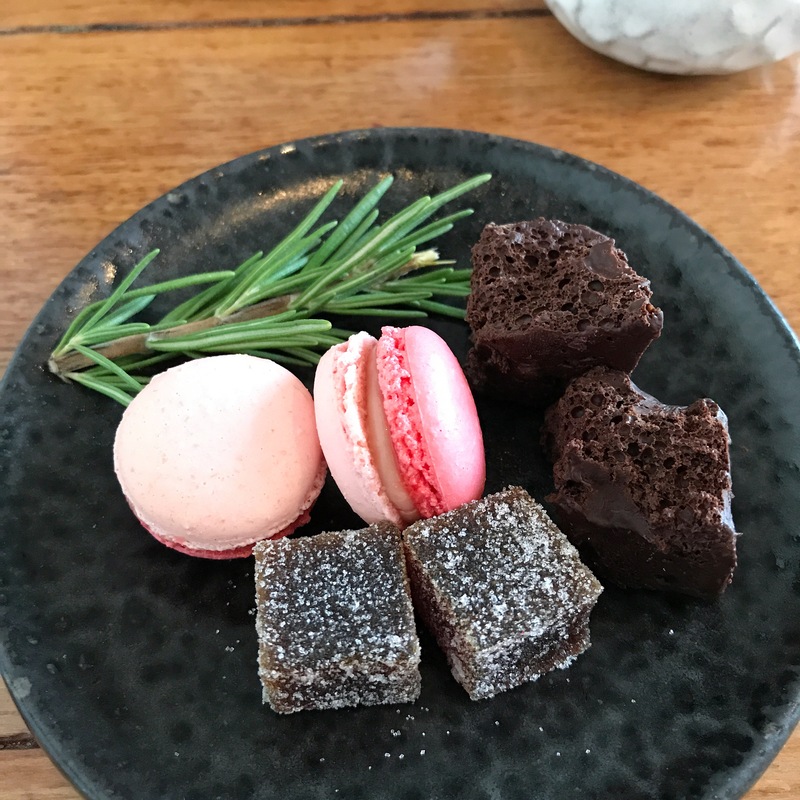 Along with Paulo’s coffee, we were presented with a tantalising selection of petits fours. 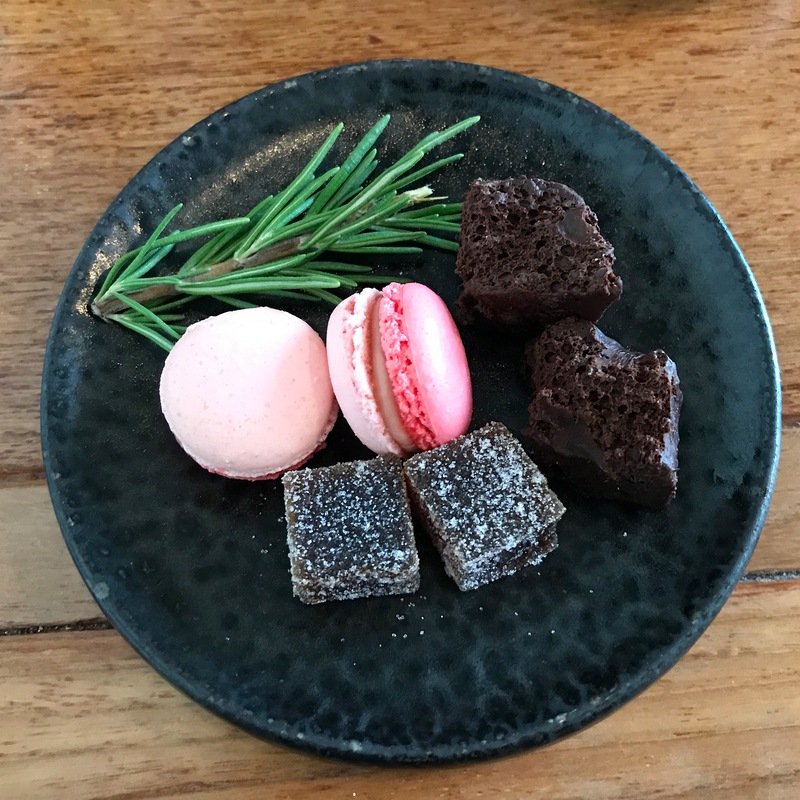 Macarons, aerated chocolate, turkish delight and fresh sprigs of rosemary took us on a voyage of passion fruit, rosemary, rose and cocoa flavours. A memorable end to an exceptional meal. The owners, managers or staff did not invite me to visit this establishment and were unaware that my experience would be the basis of a written review. It is based on my experience at my own cost and I did not receive compensation for my review. Unless otherwise noted, I am the legal copyright holder of the content and images on this blog. Please contact me for permission if you wish to use, reprint or publish any material. 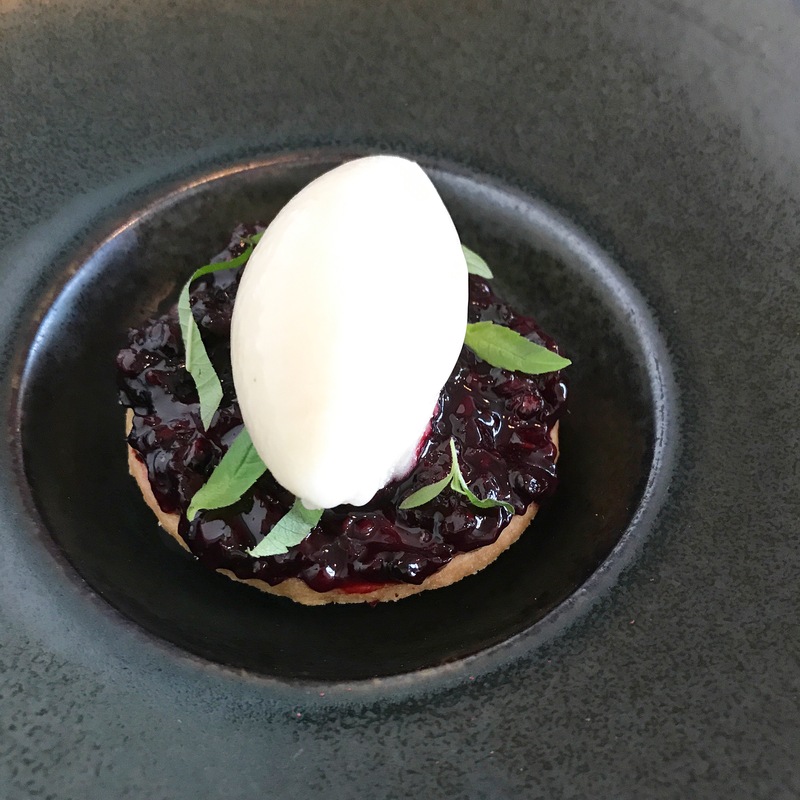 This entry was posted in Restaurants and tagged #one2belfast, Belfast, blackberry compote, brill, Copeland gin, gin, gomasio, Michelin star, Northern Ireland, Ox, petits fours, Poacher's Premium Irish Tonic Water, rose veal, sablé, sea trout, Shortcross gin, tonic by One Two Culinary Stew. Bookmark the permalink.